March 26, 2002 Sustainable Rangelands Roundtable Process and Procedures Tom Bartlett. 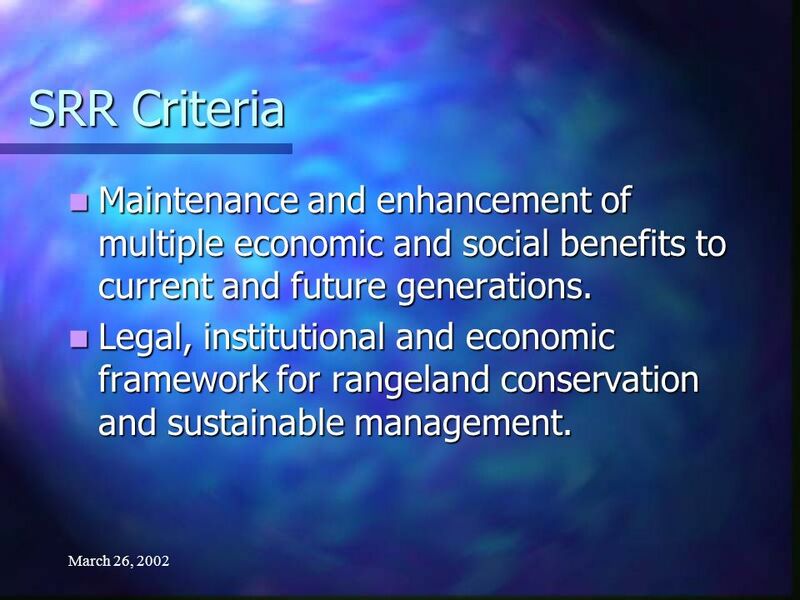 2 March 26, 2002 SRR Vision for Rangelands We envision a future in which rangelands in the U.S. provide a desired mix of economic, ecological and social benefits to current and future generations. 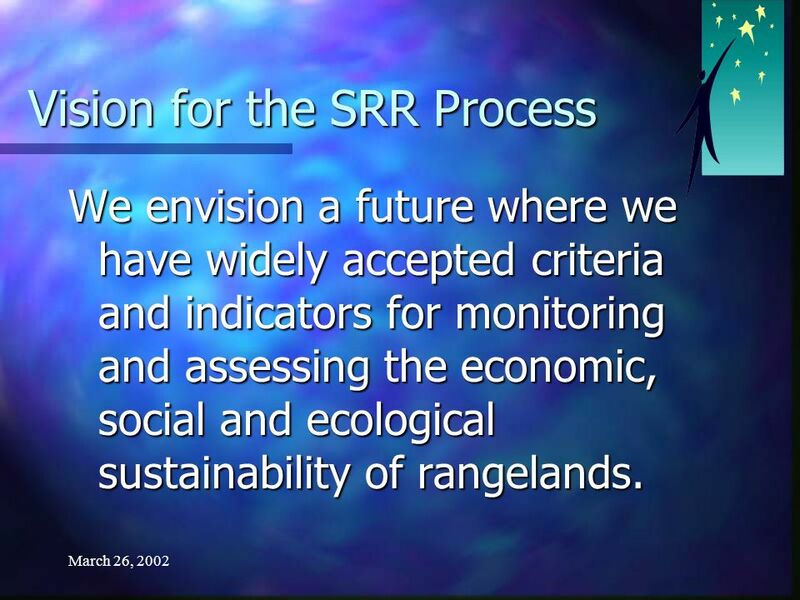 3 March 26, 2002 Vision for the SRR Process We envision a future where we have widely accepted criteria and indicators for monitoring and assessing the economic, social and ecological sustainability of rangelands. 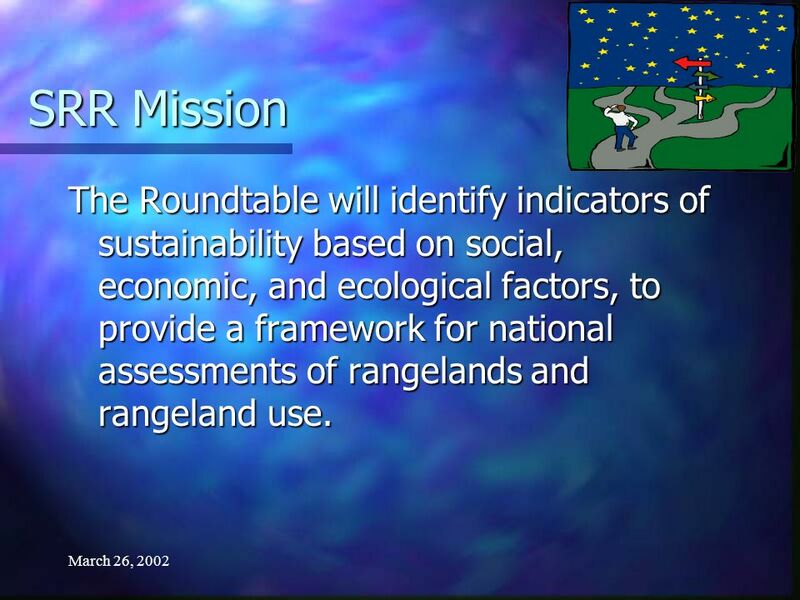 4 March 26, 2002 SRR Mission The Roundtable will identify indicators of sustainability based on social, economic, and ecological factors, to provide a framework for national assessments of rangelands and rangeland use. 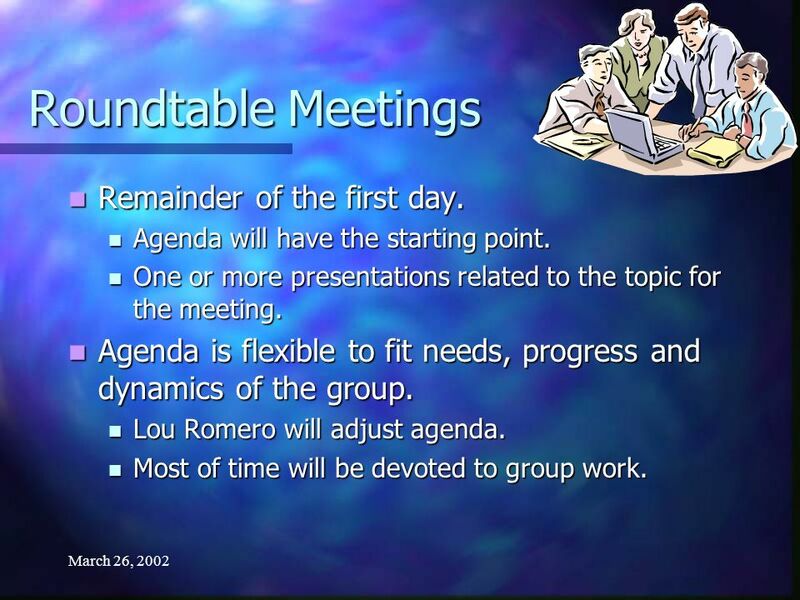 7 March 26, 2002 Roundtable Meetings At the end of day two: At the end of day two: We will decide what we have attained. We will decide what we have attained. We will determine the topics for the Delphi process between the meetings. 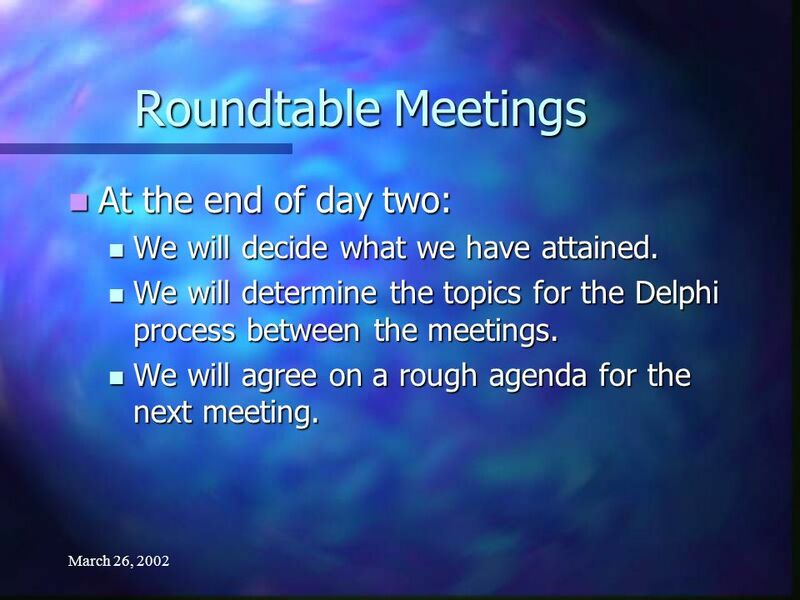 We will determine the topics for the Delphi process between the meetings. We will agree on a rough agenda for the next meeting. We will agree on a rough agenda for the next meeting. 8 March 26, 2002 Collaborative Delphi Building between meetings. Building between meetings. Continue to develop ideas. Continue to develop ideas. Obtain discussion and agreement on products of the previous meeting. Obtain discussion and agreement on products of the previous meeting. Discuss needs for next meeting. Discuss needs for next meeting. 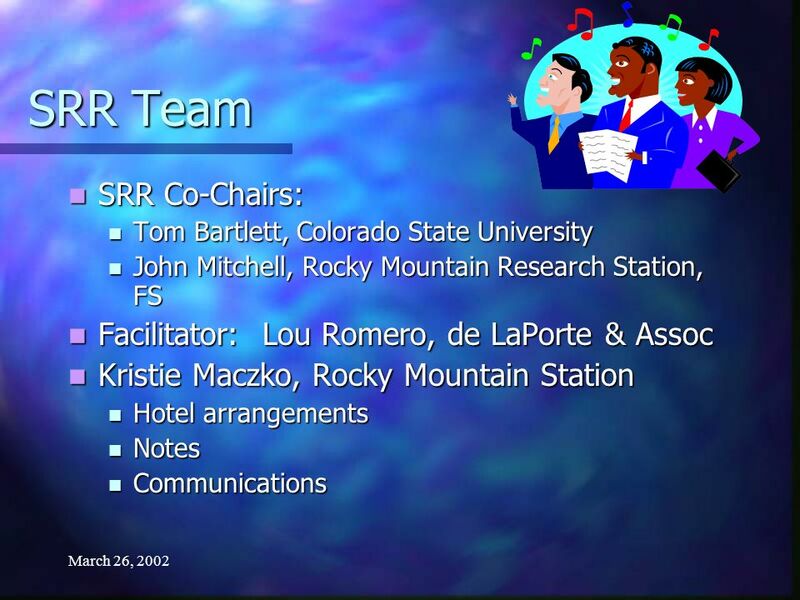 To be successful, SRR members must participate and exchange ideas. 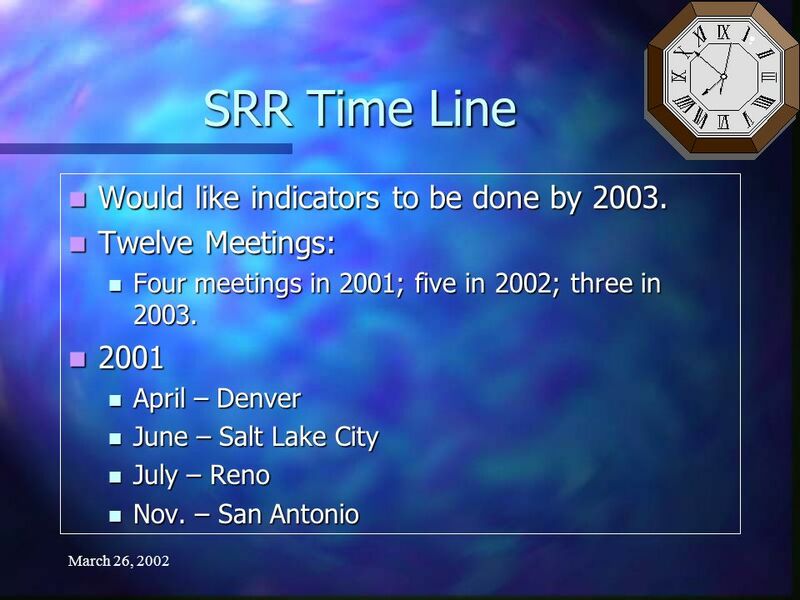 To be successful, SRR members must participate and exchange ideas. 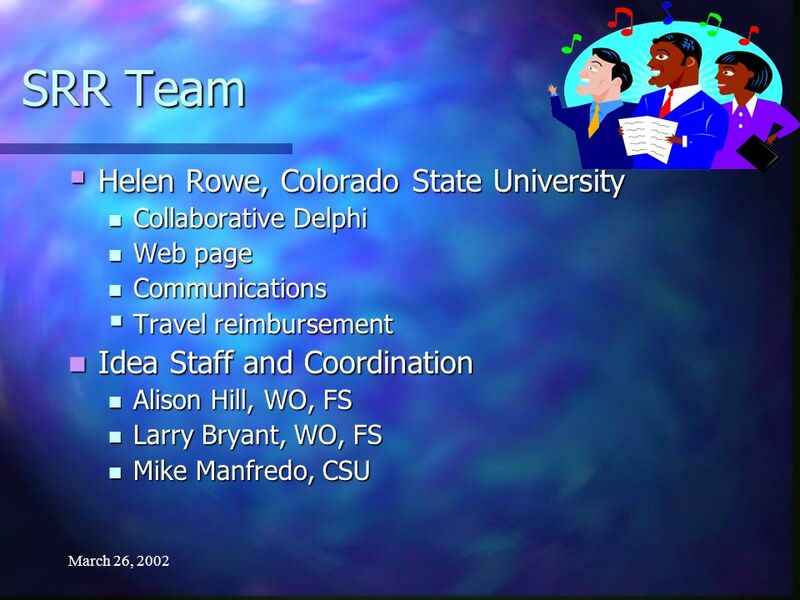 9 March 26, 2002 Collaborative Delphi Open-ended or opinion questions sent out to participants. Open-ended or opinion questions sent out to participants. Responses are analyzed and summarized. Responses are analyzed and summarized. Individual responses are anonymous. Individual responses are anonymous. Process is iterative. Process is iterative. 17 March 26, 2002 Schedule of Meetings 2002 Tucson, AZJan. 9-10, 2002 Tucson, AZJan. 9-10, 2002 Denver,COMarch 26-27, 2002 Denver,COMarch 26-27, 2002 Washington, DCMay 29-30, 2002 Washington, DCMay 29-30, 2002 Billings, MTJuly 30-31, 2002 Billings, MTJuly 30-31, 2002 San Diego, CAOct. 29-30, 2002 San Diego, CAOct. 29-30, 2002 2003 2003 Florida, Albuquerque, D.C. Florida, Albuquerque, D.C.
19 March 26, 2002 Products of SRR Symposium and Proceedings at the 2002 SRM Annual Meeting in Kansas City, MO Symposium and Proceedings at the 2002 SRM Annual Meeting in Kansas City, MO Workshop at ESA meeting - Tucson Workshop at ESA meeting - Tucson Report on Sustainable Rangelands in Spring, 2003. Report on Sustainable Rangelands in Spring, 2003. Will be used as input into First Approximation Report – June 2003. Will be used as input into First Approximation Report – June 2003. Complement report on Sustainable Forest Management. Complement report on Sustainable Forest Management. 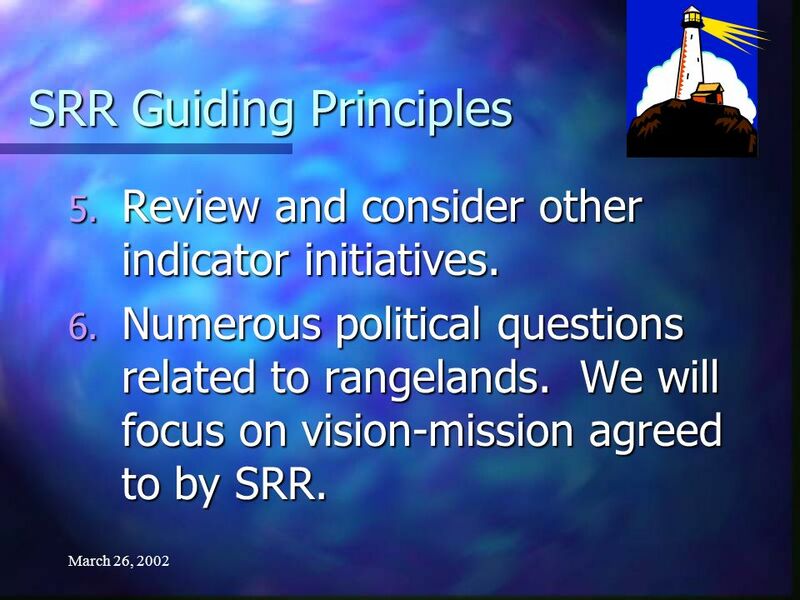 20 March 26, 2002 SRR Guiding Principles 1. Collectively, indicators should guide monitoring efforts to measure rangeland sustainability in the U.S. at the national scale. Indicators should guide monitoring efforts at multiple scales. 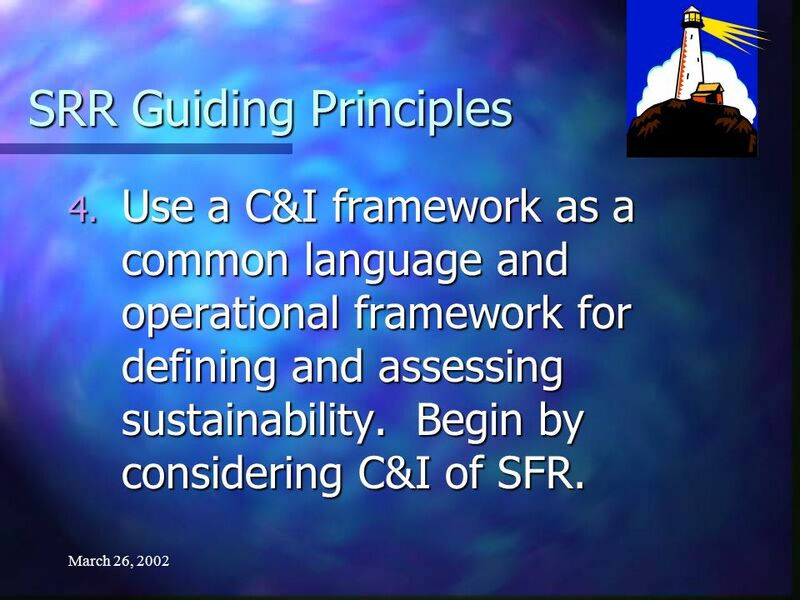 21 March 26, 2002 SRR Guiding Principles 2. Ensure that the indicators employ the appropriate temporal and spatial scales for assessing the criteria. 3. Collectively, C&I will address social, ecological, and economic aspects of sustainability. 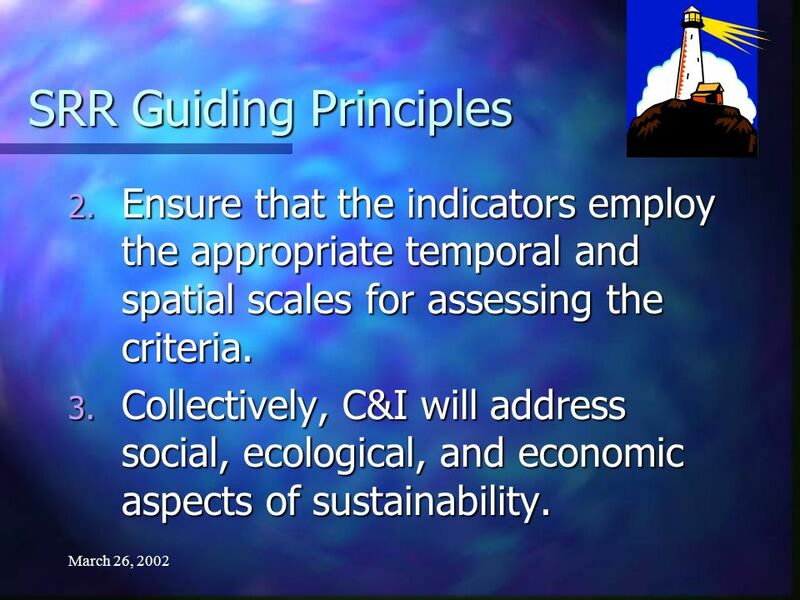 22 March 26, 2002 SRR Guiding Principles 4. Use a C&I framework as a common language and operational framework for defining and assessing sustainability. Begin by considering C&I of SFR. 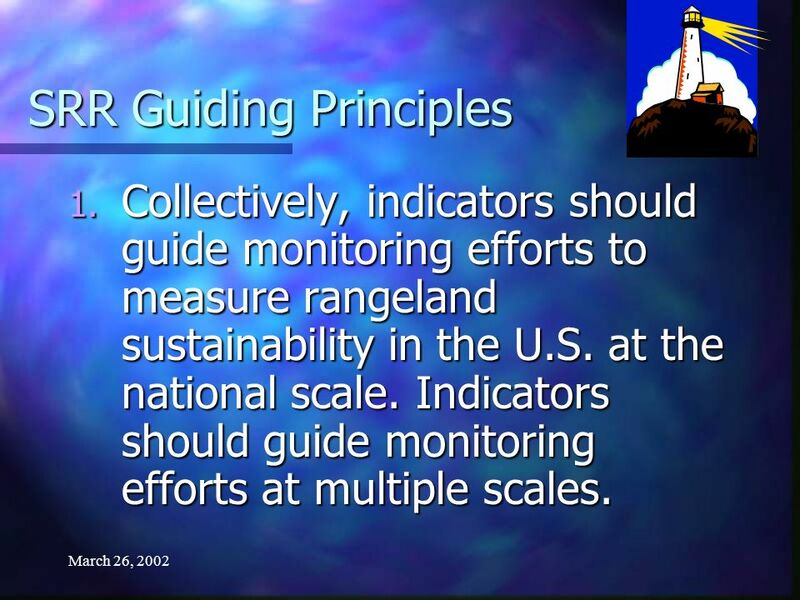 23 March 26, 2002 SRR Guiding Principles 5. Review and consider other indicator initiatives. 6. Numerous political questions related to rangelands. We will focus on vision-mission agreed to by SRR. 24 March 26, 2002 SRR Guiding Principles 7. Process will feature outreach to stakeholders, open dialogue, and respect for differing opinions. 8. 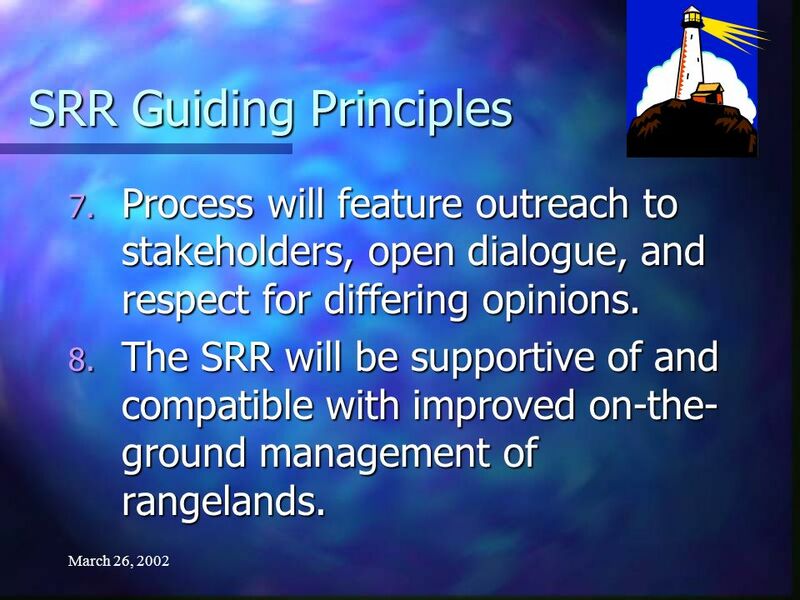 The SRR will be supportive of and compatible with improved on-the- ground management of rangelands. 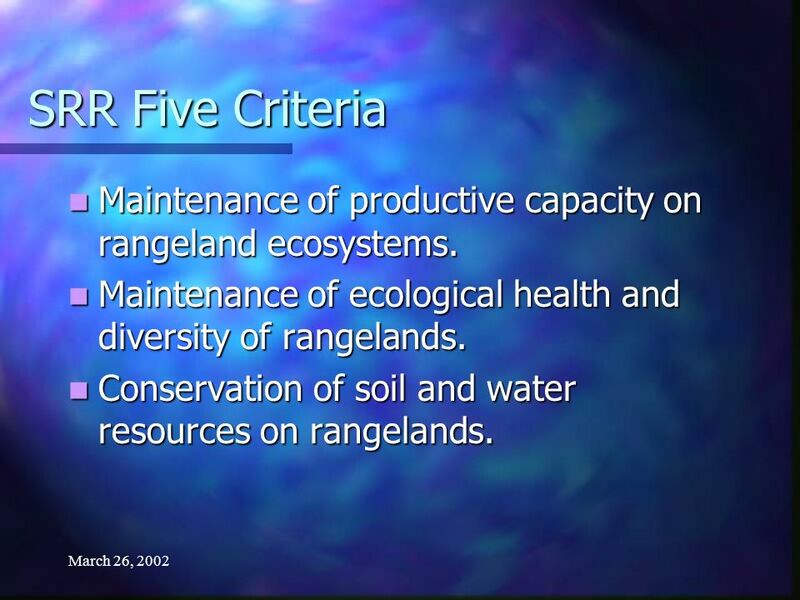 25 March 26, 2002 SRR Five Criteria Maintenance of productive capacity on rangeland ecosystems. Maintenance of productive capacity on rangeland ecosystems. Maintenance of ecological health and diversity of rangelands. Maintenance of ecological health and diversity of rangelands. Conservation of soil and water resources on rangelands. Conservation of soil and water resources on rangelands. 26 March 26, 2002 SRR Criteria Maintenance and enhancement of multiple economic and social benefits to current and future generations. Maintenance and enhancement of multiple economic and social benefits to current and future generations. Legal, institutional and economic framework for rangeland conservation and sustainable management. Legal, institutional and economic framework for rangeland conservation and sustainable management. 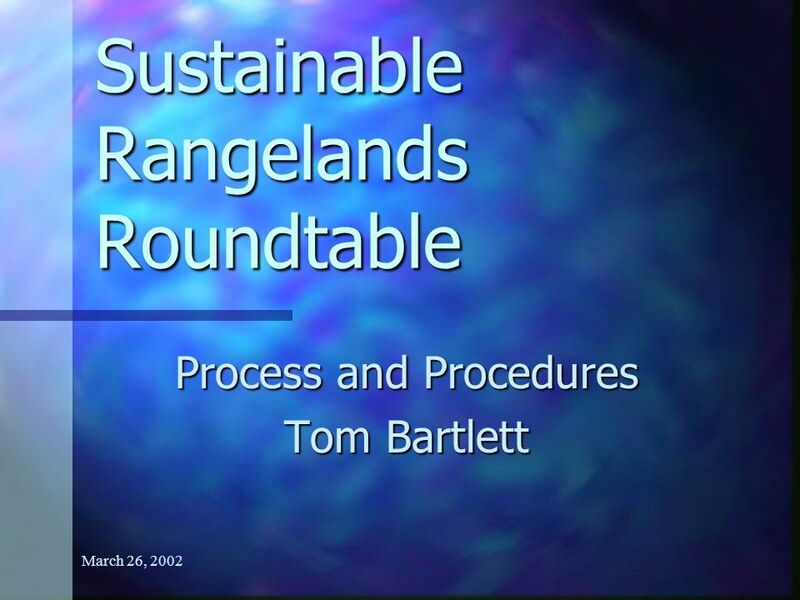 Download ppt "March 26, 2002 Sustainable Rangelands Roundtable Process and Procedures Tom Bartlett." Definition of Rangelands and Forests Paul Geissler Alison Hill. 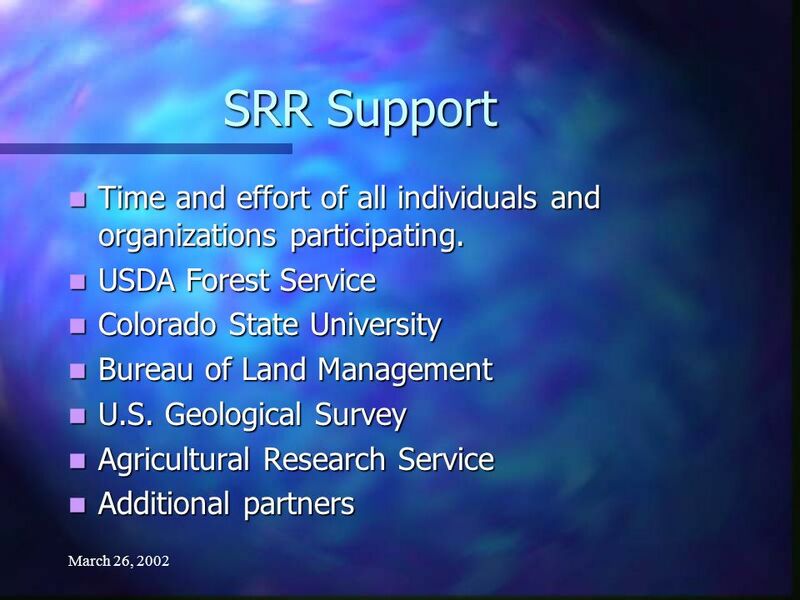 Overview of SFR C&I, Other Roundtable Efforts, and Linkages to SRR Alison Hill Reno NV Roundtable for Sustainable Rangelands Jul 23-26, 2001. DELPHI #25 RESULTS SRR Strategic Planning Meeting Denver, CO July 27, 2005 Jaime Whitlock. Sustainable Rangelands Roundtable Development and Evolution of the Criteria and Indicators. FGDC Veg Subcommittee Established to: Promote standards of accuracy and currentness in vegetative data financed in whole or in part by Fed funds; Exchange. 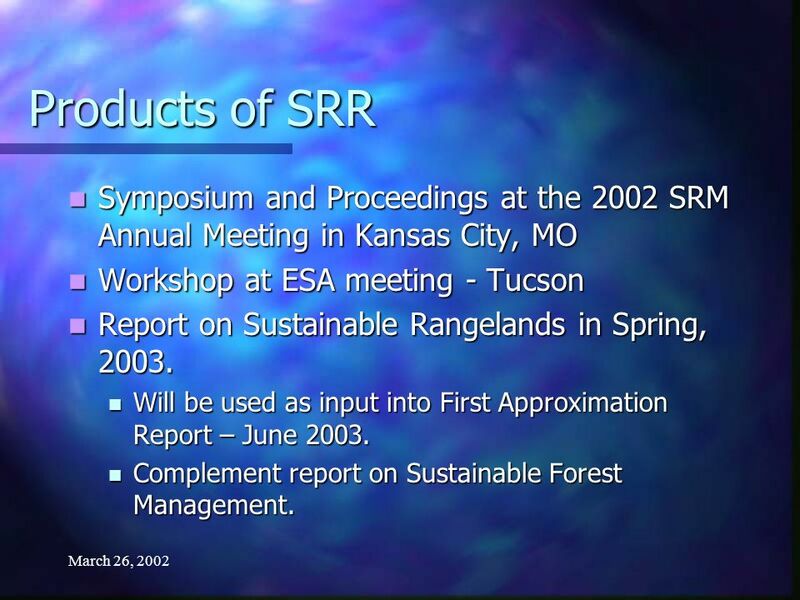 May 30, 2002 Sustainable Rangelands Roundtable. Purpose Today Introduce the Sustainable Rangelands Roundtable Introduce the Sustainable Rangelands Roundtable. The Collaborative Delphi Helen Ivy Rowe. Purpose To better represent the views of the SRR we used the Delphi process to identify five key points that. RESEARCH ON SUSTAINABLE RANGELAND MANAGEMENT. Research Needs in the 21 st Century 1.Does the indicator assess the criterion? 2.At what scales are the. The Collaborative Delphi Helen Ivy Rowe. 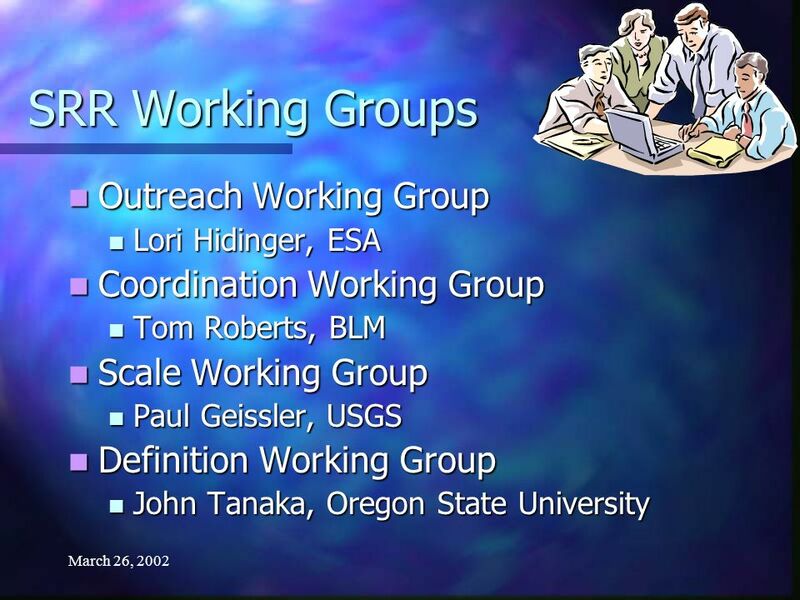 Purpose To better represent SRR at the ESA meeting and to elicit ideas for new example topics we used the Delphi. July 24, 2001 Sustainable Rangelands Roundtable Process and Procedures Tom Bartlett. 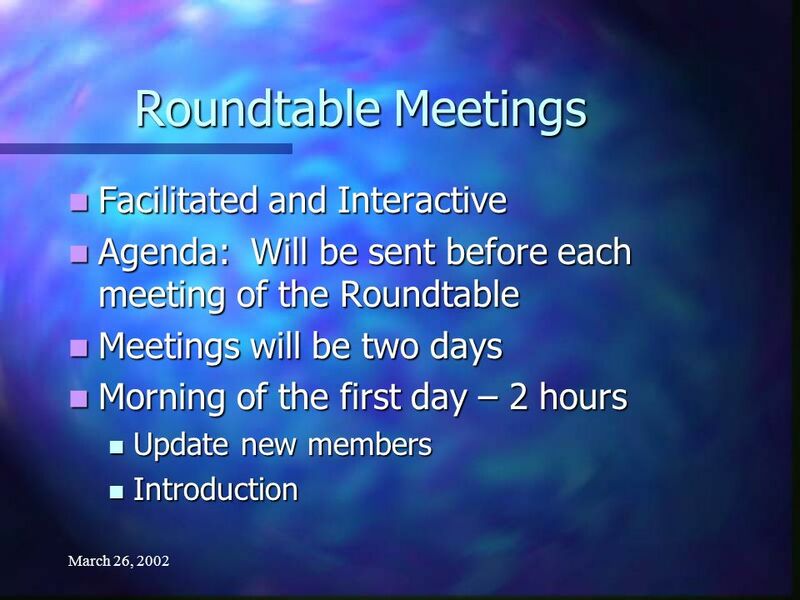 November 7, 2001 Sustainable Rangelands Roundtable Process and Procedures Tom Bartlett. SRM February 17, 2002 Future Plans & Milestones of the Sustainable Rangelands Roundtable Tom Bartlett And John Mitchell. 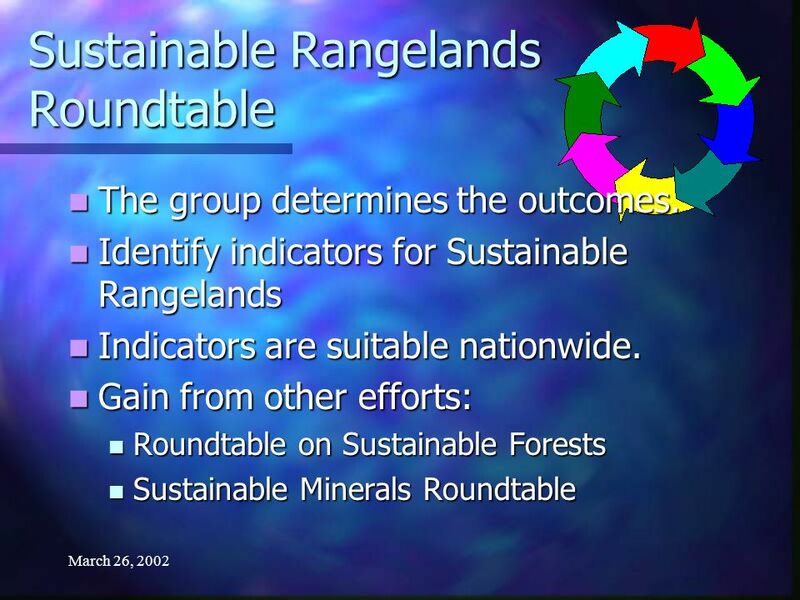 July 30, 2002 Sustainable Rangelands Roundtable. 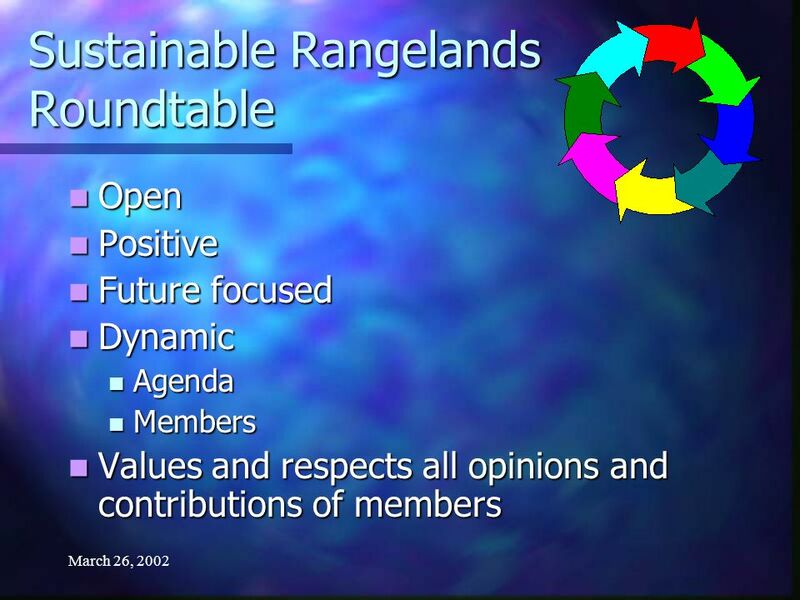 July 30, 2002 Purpose Today Introduce the Sustainable Rangelands Roundtable Introduce the Sustainable. February 17, 2002 SRM The Purpose & Process of the Sustainable Rangelands Roundtable E. Tom Bartlett, Helen I. Rowe, Kristie Maczko. 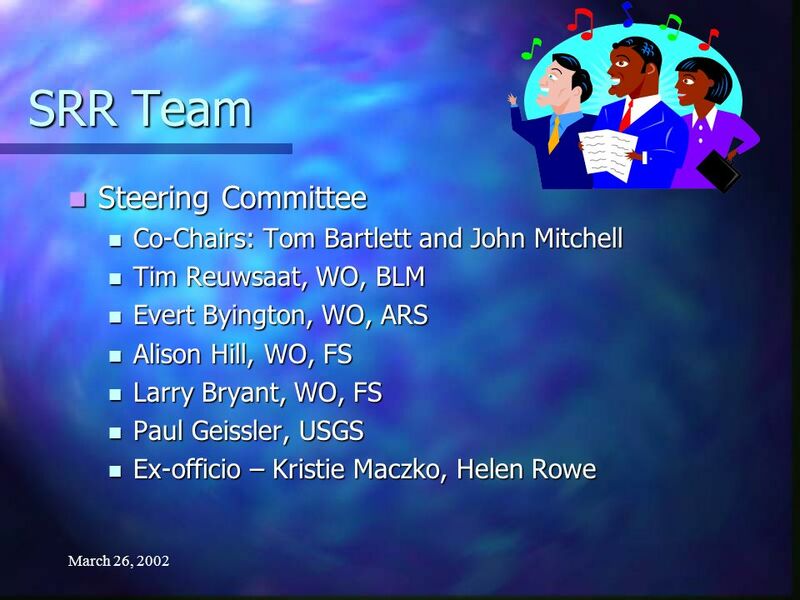 Oct. 29, 2002 Sustainable Rangelands Roundtable. Oct. 29, 2002 Rangelands 42% of continental U.S. 42% of continental U.S. 587 million acres non-federal. August 20, 2003 Sustainable Rangelands Roundtable. 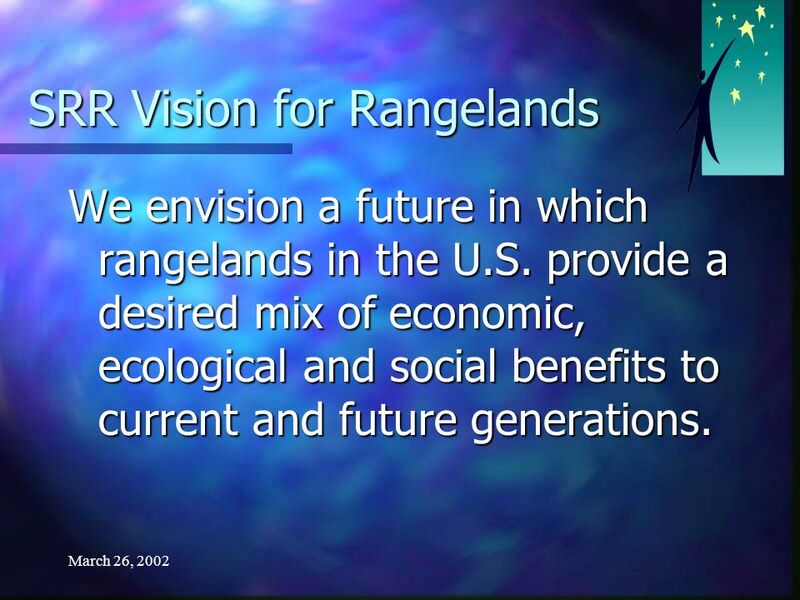 Jan. 15, 2003 Sustainable Rangelands Roundtable. Jan. 15, 2003 Tenth SRR Meeting Fort Myers, Florida January 14-16,2003. Linkages Between Rangeland Indicator Efforts: Sustainable Rangeland Roundtable and Heinz Center Programs Duncan T. Patten Montana State University. Criteria and Indicators Building A Common Language for Monitoring Forest Sustainability in the Northeastern Area Terri Heyer, Watershed Program USDA Forest.